Röchling Automotive and DSM are celebrating the 2012 Automotive Innovation Award (Powertrain Segment) from the Society of Plastics Engineers –Europe. The award was received for the first serial production of a DSM Akulon® based Air-intake Manifold (AIM) with an integrated liquid charged air cooler (LCAC). This pioneering advance, utilizing Akulon® polyamide (PA) from DSM, offers space, weight, and cost-saving advantages, and increased engine responsiveness. As a result it contributes to cost effective, high performance and reliable engines with high torque, low fuel consumption and minimal CO2 emissions. The integrated system, developed by Röchling and Volkswagen (VW), achieved a 20% reduction in the number of parts, weight and costs, compared to similar turbo charged engines with air-to-air charged air coolers. Furthermore, the compact solution creates a 40% reduction in engine compartment package space and air volume which translates into more engine design freedom and virtually eliminates turbo lag.Röchling selected Akulon K224-HG6 (30% glass reinforced, heat stabilized PA) resin because it offered a cost effective, robust balance of long term thermal and mechanical performance, coupled with consistent processability during the molding and welding processes. 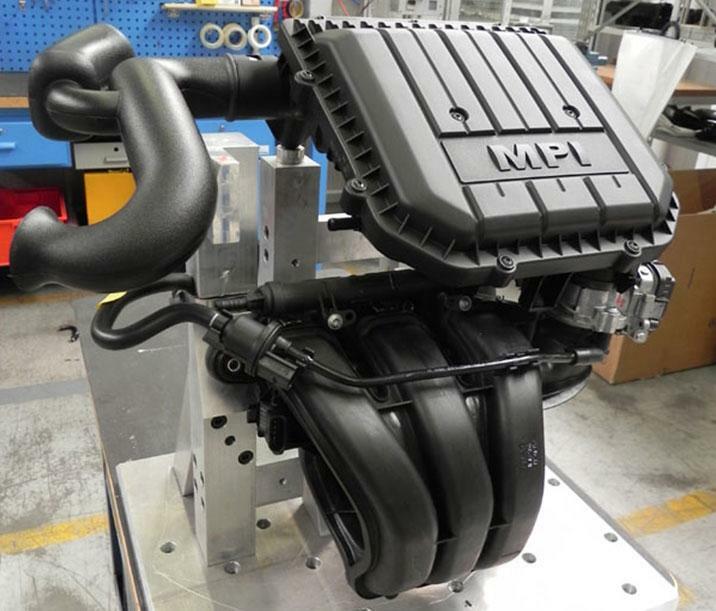 “Realization of the fully integrated air intake manifold was a challenge, but the trend towards this basic design is gaining momentum everywhere. It is a real breakthrough,” comments Marco Barbolini, Product Manager at Röchling Automotive AG & Co. KG. “Integrating the heat exchanger into the intake manifold reduces air volume, giving the engines more punch, and eliminates a bunch of quite expensive parts.”“DSM was honored to have been selected to support Röchling in their efforts to achieve challenging cost, performance, fuel efficiency, and CO2 reduction targets,” adds Keith Siopes – Global Industry Segment Manager at DSM. “Contributing to innovative solutions aligns with our commitment to support customers with solutions for cost reduction, performance improvement, fuel efficiency, and carbon footprint reduction.” According to VW, the water operated charged air cooler, incorporated into the air intake manifold, with its own cooling cycle, is one of the key advanced engine technologies utilized as part of the TSI engine strategy. The TSI strategy targets motorists who enjoy performance and care about the environment. TSI engines provide VW customers with the joy of driving and the joy of saving, combined with low hydrocarbon emissions and low fuel consumption values.